Thank you for your interest in Southside Cultural Center of Rhode Island! You can expect a response from staff within 3 business days. Once we confirm availability for your request, we will ask you to sign our Rental Agreement Form. Receipt of a signed Rental Agreement form and a 50% deposit will secure your rental. Tours of the space are available by appointment. See photos below (roll mouse over photos for specs). Year-round inter-generational cultural programming of “hands-on” classes and workshops (theatre, improv, storytelling, dance, song…) for the general public. *Non-commercial kitchen may be used for food preparation when renting the Community Space and/or Conference Room at no additional charge. Use of technical equipment, chairs, tables, etc. available upon request. 300 flexible seat, proscenium theater presents and co-presents high-quality performing arts productions on the main stage for the local, Greater Providence and touring group/company. The theater is equipped to accommodate solo and full company productions, mixed bill performances, showcases, etc. in dance, theatre, music. Please note: All technical equipment (hard and soft goods) must be provided or arranged by renter. The SouthLight Pavilion is a luminous, flexible space that opens in all directions using 24 monumental swing doors. 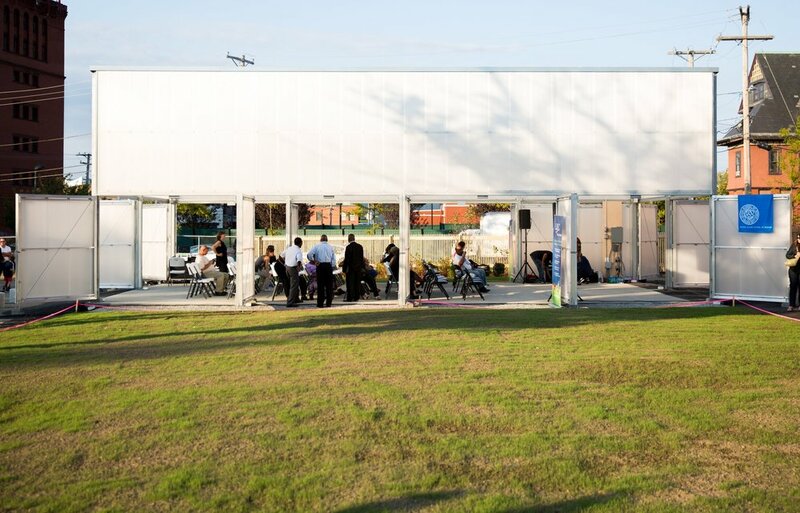 The 1,200 square-foot pavilion is constructed from a greenhouse kit, re-purposed to transform an economical, pre-engineered shed into a building with civic presence. Its interior naturally illuminated during the day, due to its translucent polycarbonate cladding design, and at night through the continuous glow of the interior lighting, The SouthLight Pavilion serves as public space, event venue, storm water mitigation and educational tool. A nearly 10,000-square-foot generous lawn stretches out on both sides of the pavilion, creating spillover space for large events and a pleasant environment for public use when the pavilion is closed. The SouthLight Pavilion is programmed seasonally (April - September) and made available to renters during this season. Use of parking lot for events available upon request. *Not to exceed 8 hours of programming. Ex. 11a – 9p including set-up and breakdown. 100 people max in pavilion. *Prime or Sub-prime variations do not apply in day rates. **Weekly rates available upon request. Pricing negotiated based on event specifics. PopUp! @ SCCRI is a retail-based marketplace and/or gallery space providing short-term merchant and exhibition opportunities for local and regional artists and artisans. The pop-up can accommodate rotating, solo, and group 2D/3D-based visual arts exhibitions. Curatorial opportunities for local and regional curators and collectives are also available. Featured amenities: 500+ sq ft, 150 capacity, internet access, security camera, secured-doors, parking access, wheelchair accessible.